During my second year in college, I had a wake-up call. I was a bit adrift and not accomplishing much academically or in any other way. Underneath the noise of my life was a yearning to make an impact…to do something more than just graduate, find a job and start fighting grid-locked traffic. Stephen Jobs said we all want to put our own “dent” in the universe. 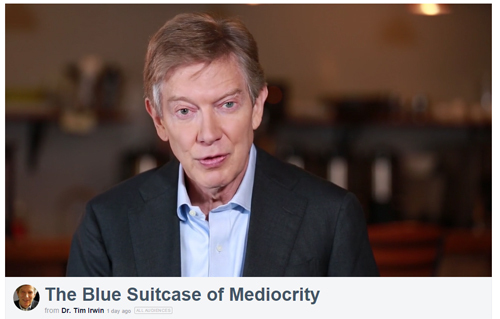 Years later, I fell into a metaphor that captured my yearning—I had been living out of the blue suitcase of mediocrity. When you watch the video below, you’ll see what I mean. At the time it was painful, but even then, my wife, Anne, told me that someday it would make a good story! She was right. What might you do differently to enlist others in the pursuit of excellence?